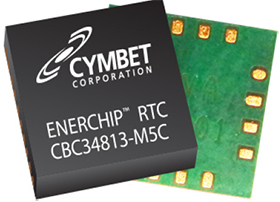 The EnerChip RTC CBC34813-M5C combines a Real-Time Clock (RTC) and calendar optimized for low power applications with an integrated rechargeable solid state backup battery and all power management functions. The EnerChip RTC ensures a seamless transition from main power to backup power in the event of power loss. The integrated power management circuit ensures thousands of charge-discharge cycles from the integrated EnerChip and manages battery charging, discharge cutoff, power switchover, and temperature compensation to maximize the service life of the device. The CBC34813 provides greater than 5 days of backup time in the event main power is interrupted. The integrated EnerChip recharges quickly, has extremely low self-discharge, is non-flammable, and RoHScompliant. The EnerChip is charged automatically anytime VDD is above 2.5V. Data is transferred serially via an SPI-bus. Alarm and timer functions provide the option to generate a wake-up signal on an interrupt pin.